This is a great stack for dealing with stress, promoting relaxation, and brightening your mood. This stack can be used for an incidental boost when necessary, or taken daily. Its peak effects last 4 – 5 hours, with residual effects up to 10 hours afterwards. After 5 hours, another dose can be taken to last the rest of the day. This stack combines very well with coffee for a more energetic positivity. For making a concerted push to get a lot done in a positive mindset, also have a look at the Motivation Stack. 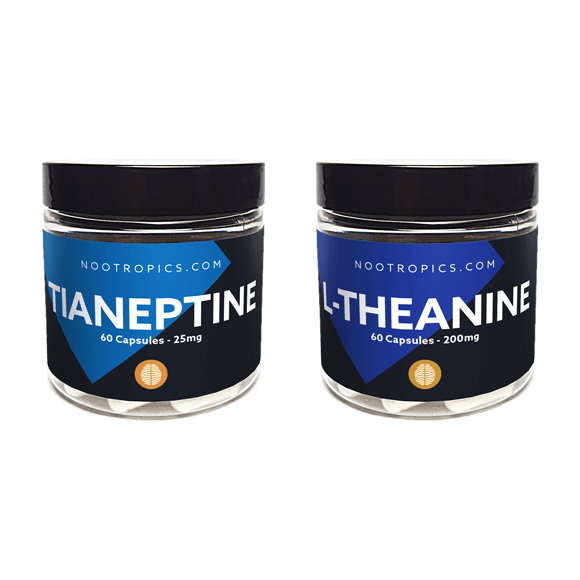 Tianeptine is a very effective nootropic for mood brightening and against anxiety and stress. As opposed to Tianeptine Sodium (Stablon), Tianeptine Sulfate has a long lasting effect of over 5 hours. L-Theanine is an extract from green tea, which creates an anti-anxiety effect. It helps the mind stay calm and deal gracefully with any frustrating things that happen in day to day life. It also synergizes very well with coffee, reducing the tenseness that can come with caffeine consumption. Capsules per day: 1 of each, up to two times per day. Effect duration: Peak effects 4 – 5 hours, with residual effects up to 10 hours after that. Extended use: This stack is suitable for daily use, but can also be used incidentally instead. If using this stack daily, do not use it incidentally as well. If this stack makes you drowsy or too relaxed, caffeine or Adrafinil can be used to boost your wakefulness. Long term tianeptine use can have opiate-like withdrawal symptoms. Ensure that usage is gradually reduced with care, and if ever in doubt, consult a qualified medical professional. If you have ever been addicted to opioids, Tianeptine may have an immediate addictive effect. Do not take Tianeptine if you are currently on MAOIs or have been in the previous 14 days. Do not consume alcohol if you have taken Tianeptine.